Coburg has selected the side taking on Werribee this Saturday night, after the nail-biting 3-point defeat against Collingwood in round one. 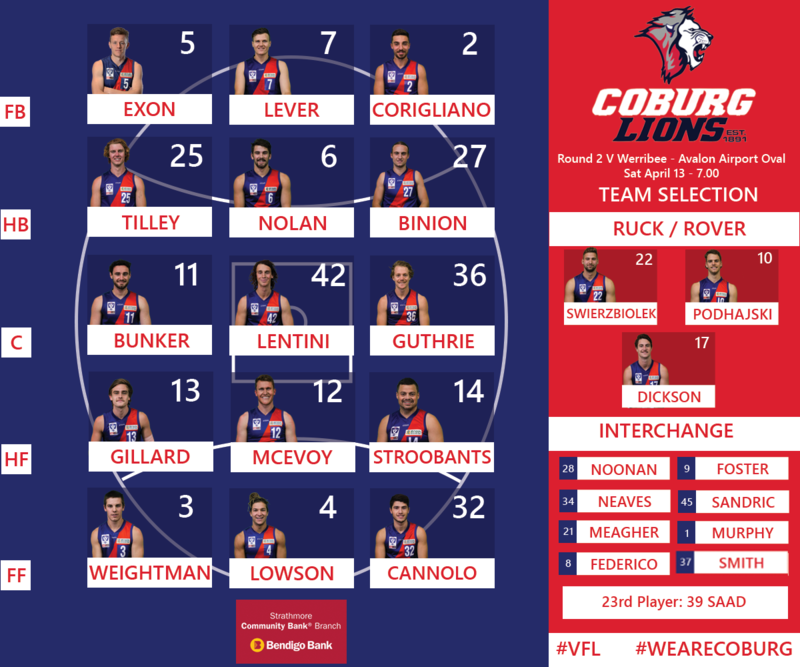 After a well-rounded team effort on the weekend, Coburg has backed the same group of twenty-three in this week’s selection, with four additions to the extended bench. All six Lion debutants from round one (Foster, Gillard, Neaves, Noonan, Saad, Stroobants) are named in the extended squad after displaying impressive performances on the weekend and proving that they have what it takes to succeed at VFL level. Dickson, Nolan, Weightman, Swierzbiolek, and Bunker will all be looking to continue their excellent starts to the season after they all had plenty of the ball last Saturday. With so many young players on Coburg’s list, Alex Federico, Tom Meagher and Hedley Smith are also strong contenders to wear the red and blue for the first time. Federico arrived at Coburg this season with VFL experience at the Northern Blues and games in the Northern Football League’s West Preston Lakeside, when not selected for the Blues. Federico played nine games with the Blues averaging 11 disposals and 6 contested possessions per game. Meagher, recruited from Upper Ferntree Gully, has been named on the interchange bench. The 183cm Midfielder is known for excelling in one-on-one contests and his running ability which will be a strong asset for Coburg. Smith joined us after an impressive pre-season, and was a strong performer for Fitzroy Stars in their narrow loss to Diamond Creek. He is a constant danger around goal and if he receives the call up, will be a danger for all Werribee defenders. Werribee has started their season under the reigns of Port Adelaide’s 2004 Premiership winning coach, Mark Williams. The Tigers already have a win under their belt after defeating North Melbourne at home. The Tigers best included Former Brisbane Lion Josh Clayton who had 27 disposals, 8 marks, and 4 clearances. Matt Hanson stood out with 31 disposals and 7 tackles, meanwhile, Michael Barlow was a key cog in the Werribee midfield but has suffered an unfortunate injury and will miss Saturday night’s game for Werribee. Up forward Tim House was dominant and it will be crucial for Coburg to nullify these dominant players. After a narrow 3-point loss the Lions are hungry for a win. We encourage all Coburg Football Club members and supporters to get to the game and cheer on our boys! This week we will travel to Avalon Airport Oval, Werribee, with the first bounce at 7 pm.